Material:the base of the furnace is one-piece high light aluminum alloy and it's light weight and high strength,the fire plate and the bracket are stainless steel, high temperature resistance. 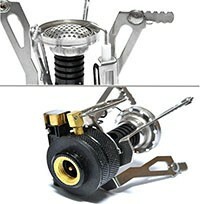 Super Compact: Collapsible design save more space,perfect for hiking or camping and any other outdoor activities. 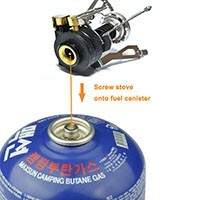 Fuel Canister:butane or a blended fuel mixtured by isobutane and propane,pure propane is not suitable. High Combustion Utilization:honeycomb mesh promote the circulation of oxygen,heating quickly. Easy to store and lightweight, sturdy and large work area ,perfect for frying pans cookware. 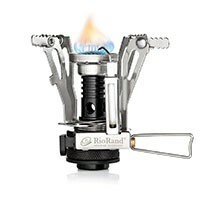 This RioRand Ultralight backpacking camp stove is a great stove, WITH PIEZO IGNITION, that folds into its protective case,weighs only 3.9oz packed in the case! 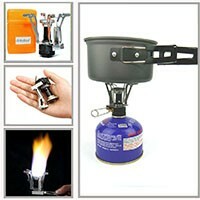 This stove is built very well! 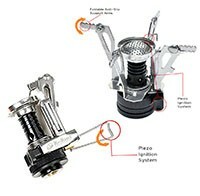 Quality construction and materials are at work in this stove.These stoves wok with any screw top butane / propane canisters, available just about anywhere, MSR, coleman, camping gaz, etc. This stove will also simmer. 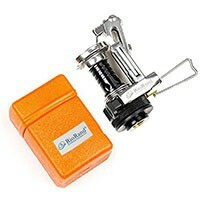 It has a fully adjustable flame! This really is an impressive stove. LOW price HIGH performance.These would make great primary stoves, back up stoves, emergency, spares, Boy Scout troops etc etc endless possibilities!